If Toyota chief Akio Toyoda wants to make more head-turning cars, he'll certainly succeed with this one. 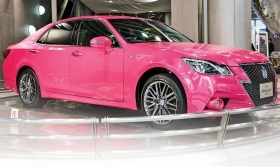 In September, Toyota will start selling a hot-pink Toyota Crown -- a top-end Japan sedan typically favored by the over-50 set, midcap corporate executives and livery companies and habitually fielded in a pulse-quelling hearse-black finish. It's a big gamble for a 14th-generation nameplate that usually elicits yawns from onlookers, if they notice it at all. Toyota is taking orders only Sept. 1-30 and only in Japan. So act fast if you look pretty in pink. The electric-fuchsia Crown actually debuted in November to shock the public into noticing the redesign. Toyota's designers also outfitted the latest redo with a huge Darth Vader grille. The grille stayed. But the color was supposed to be a one-off. At the redesign launch event, Toyoda feigned embarrassment at the flamboyant flamingo parked next to him on the stage. "My initial reaction was: 'You're kidding! Please, not pink,'" he told reporters. In truth, the car symbolized Toyoda's personal directive to his stylists to take more risks with polarizing designs.